Through generous grants from Crader Distributing and Stihldealers.com, as well as DuPont Pioneer, the Missouri 4-H Foundation offers grants of up to $1,000 to match funding for a 4-H Community Service project. Projects are youth-driven: youth are involved in planning, fundraising and execution. Projects offer youth opportunities to serve, work and develop life skills. Projects are geared to the skill level of youth participants. Projects demonstrate a "Return on Investment" in the community. Fundraising events that benefit the 4-H program hosting the event. Successful project examples include: state lake improvements and waterfowl box construction, raised garden constrction at nursing homes, community vegetable gardens, heirloom gardens at historic sites, day camps and events for special needs youth and recycling events. Be submitted by an organized 4-H entity such as a county 4-H council, 4-H club, county 4-H foundation or county MU Extension council acting on behalf of the 4-H group. Be signed by a 4-H member or leader and the 4-H youth specialist or YPA responsible for the county from which the proposal is submitted. 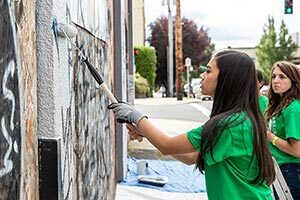 Involve 4-H members and adult volunteers, as well as other youth, adults and community members in a meaningful project to serve others, improve the community and make a difference. 4-H members should be actively invovled in "learning by doing" through community service. Demonstrate recipt of matching funds or in-kind contributions. Grant monies must have at least 100% match funds. For example, a $100 grant request must have $100 in matching funds or in-kind contributions such as labor, materials, supplies, etc. Youth labor is a priority. Include a public relations plan. Describe how your group will work with the media and other community information sources to recognize 4-H, the Missouri 4-H Foundation, Crader Distributing and Stihldealers.com, or DuPont Pioneer. Applications must be completed electronically and submitted to the Missouri 4-H Foundation at 4hfoundation@missouri.edu. We highly encourage you to read How to write a winning Missouri 4-H Foundation Community Service grant application (PDF) before applying for funds.